It’s finally here! A Christmas instalment of the affable Hippopotamus that we have enjoyed reading for 35 years. So many childhoods have been shaped by a hippopotamus eating cake on the roof. And so many little imaginations have expanded as they imagined the exciting antics of a roof-dwelling hippopotamus. 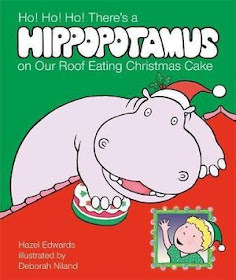 The wonderful team of Hazel Edwards and Deborah Niland have come together again for this joyful new hippopotamus adventure that must be at the top of your Christmas buying list for all the pre-schoolers you know. The story follows the familiar pattern. The noisy ‘Thump! Thump! Thump!’ on the roof. The obvious conclusion that it is, of course, the hippopotamus who lives up there. And a child’s delight in the imagined activities of the hippopotamus as he prepares for Christmas. From baking a Christmas cake to writing a Santa list and putting up a Christmas tree, the hippopotamus does all the important Christmas preparations. He does it all with an infectious smile and an individuality that kids will love. The first person, authentic child voice is so intimate and real that you immediately share the excitement, worries and joys that a child feels in the lead up to Christmas. Deborah Niland’s classic illustrations bring the hippopotamus to life again with an enthusiasm and style that will have the kids giggling and wanting more. Believe me, I know. This is currently my four-year-old’s favourite bed-time story. To be read again, and again, and again and… you get the picture. I was so excited when I heard this book was coming and it certainly didn’t disappoint. It is familiar enough for hippopotamus fans yet is a new and different story that stands on its own. And you must get the gorgeous hard cover version with a sparkly, glittery Hippopotamus on the front. It’s definitely worth it!